Lead a group of competitive eaters as they chomp their way to victory against the jaded dentist, Dr. Sweet Tooth and his diabolical new buddy, King Roach. Eat through candy, squish roaches, and keep eaters from vomiting. Make your way through increasingly challenging levels, consuming tiles with eaters and squashing tiles before they spoil to keep them from becoming infested with roaches, all while using strategy and quick reflexes. Satisfy your craving for casual fun alone or play with friends in Endless mode and compare high scores! 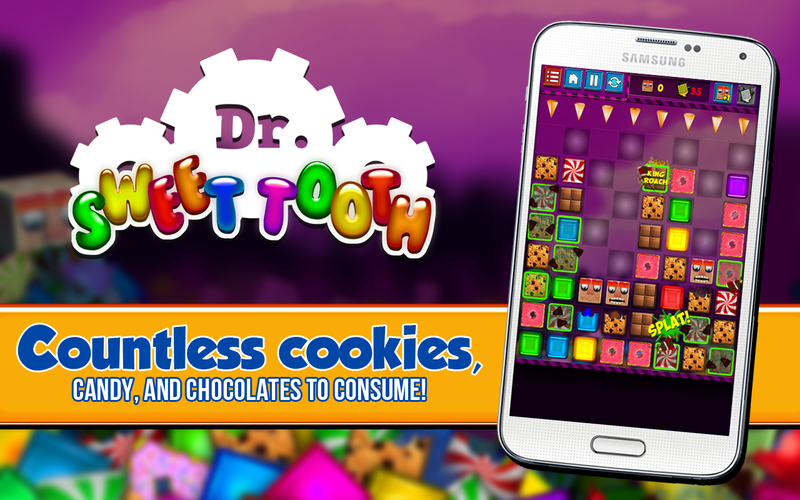 Dr. Sweet Tooth resides in the puzzle family of games. Still, it stands out as the black sheep in that family--in the best way possible. With a unique, gross twist on the puzzle genre, Dr. Sweet Tooth is a game of sweets and disgust, with cookies, gummies, peppermints, and roaches. Eaters have a chance to vomit when confronted with a rotting square or a roach. Dr. Sweet Tooth's Valentine's Day 500 Copy IndieDB Giveaway! To enter simply go to IndieDB's Giveaway tomorrow and click the large red button to enter. Checkout this gameplay video to get an idea of what the game is about. And here is a short video showing the gameplay of Dr. Sweet Tooth 2, coming out soon! We at ZebraFox Games have decided to release a desktop version of Dr. Sweet Tooth, to give those without an Android device a chance to try the game out. An app that grants players the power to command a team of competitive eaters and squish roaches to keep their eaters from vomiting.